Chamilia by Swarovski Group believes a girl should shoot for the moon this July 4. Here is a nice piece to bring out the red, white, and blue in your outfit. 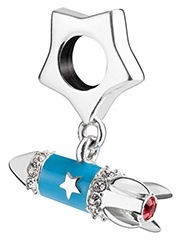 Shoot for the Moon—This Clear Swarovski Crystal and star embellished rocket with light blue enamel detailing and one Red Swarovski Crystal at its base is reminiscent of Fourth of July fun (MSRP $40). See more of the Chamilia by Swarovski Group summer 2015 charm collection here on the Apparel Search fashion blog. Learn more about Swarovski Group at their website. View more charm blog posts.